The deaths of its No. 2 leader and one of the top commanders in its war on narco traffickers sent shockwaves through the government of President Felipe Calderón, already reeling from an increasingly bloody fight against the powerful drug cartels. While officials could not immediately confirm the cause of the crash, Transport Secretary Luis Tellez said it appeared to be an accident rather than a bomb because much of the plane remained intact. Still, soldiers rapidly descended on the airport from which the aircraft had departed, in the western state of San Luis Potosi, where the officials had been holding a meeting on security. Whatever brought the Learjet down, it will be hard for the Mexican government to convince the people that it was an accident, in light of the torrent of attacks on public officials by drug gangs. High-ranking police, prosecutors and judges have been slain across Mexico this year, while assassins have massacred hundreds of rank-and-file police and soldiers. Although cartel hitmen traditionally kill their targets with firearms, they have lately grown increasingly sophisticated and ruthless  drug gangs are alleged to be behind a bomb that exploded in Mexico City in February and grenades that were thrown into a crowded plaza in September. Santiago Vasconcelos had been, over the past decade, one of Mexico's most outspoken and active figures in the fight against drug cartels. He narrowly escaped assassination in January, when federal police arrested in a Mexico City house five hitmen who had allegedly been contracted to kill him. He had held a series of top positions in the federal Attorney General's office but stepped down in August, citing personal reasons. Mouriño, 37, had been responsible for coordinating the Mexican cabinet's efforts in the crackdown on drug cartels, although he was less vocal on the issue than some of his subordinates. A close friend of President Calderón's, he had taken the post in January and survived calls for his resignation over accusations he had given government contracts to his family's company while serving as Undersecretary of Energy. In a nationally broadcast speech, Calderón offered condolences to Mouriño's children: "His death is a great weight on me. But at the same time, it is a powerful motivation to go on fighting without rest, now more than ever, for the ideals we shared." 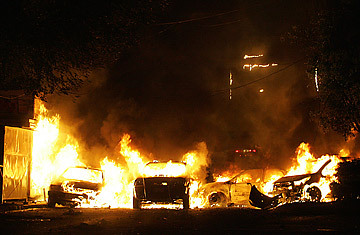 Calderón did not speculate on the cause of the crash, simply saying his government would thoroughly investigate the event. Calderón's administration has also been shaken up in recent weeks by high-level corruption scandals connected to drug cartels. On Friday, the head of the Federal Preventive Police resigned after detectives questioned him for two days about links to the Sinaloa cartel. Four days earlier, police had announced the arrest of five senior prosecutors for taking bribes of up to $450,000 per month from drug traffickers. Among information leaked to the cartels had been details of U.S. Drug Enforcement agents working in Mexico, officials alleged. The U.S. government has continually expressed support for Calderón's fight against drug cartels, and Congress has voted to support that battle with some $400 million per year. See pictures of Mexico's drug wars.